It’s been rumored and discussed for years, and now it’s happening — the SF Chronicle, at least parts of it, is now behind a paywall. In a missive somewhat confusingly entitled “SF Chronicle launches premium website; SFGate remains free” (raise your hand if you thought they were the same thing — mine is down because I worked there, but I assume many of yours are up), we learn that “premium stories and columns” will be on the subscription-only SFChronicle.com, while the paper’s archives, breaking news and “popular features like Daily Dish and Day in Pictures, event listings and guides” will be found on SFGate.com. Still confused? That’s understandable. They have a FAQ that might help, as long as your question is of a concrete nature (The answer to “I subscribe to the Chron on my Kindle, can I access SFChronicle.com content” is “no,” the answer to “do you think this will really work?” is left for you to ponder silently). Links shared by signed-in subscribers using the Tweet, Facebook, or Google + buttons on the article’s page will be readable by all, with a little note urging non-subscribers to sign up (links shared by non-signed-in subscribers, or by just cutting and pasting a link, won’t provide the full text). Less clear is if the walled-off content will be available via RSS. Other publications that have a similar model syndicate their headlines via RSS, with non-subscribers hitting a prompt to subscribe on clickthrough. If you follow the Chron using a plain RSS reader, or feed-based reader apps like Flipboard, this might matter to you. I contacted the SFChronicle.com’s support staff regarding that question, and am awaiting a response. But what you’re wondering is “how much does it cost?” That’s not abundantly clear until you click through about four levels and give them your zip code. For me in the 941s, that price was $12/month for either all-digital, or all-digital plus delivery of the Sunday paper. 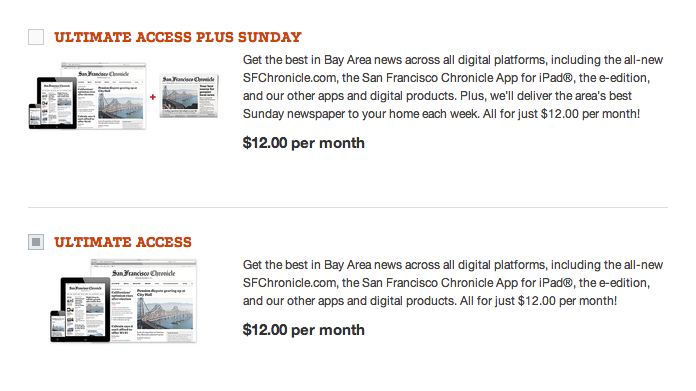 On the face of it, throwing in Sunday delivery for what seems like “free” is a foolish decision — after all, Chronicle editor Ward Bushee has famously said that “it costs more than $10 to produce and deliver each Sunday SF Chronicle.” If that remark remains true, people who choose this option could cost the Chron $28 a month. If I were to speculate — and this is just speculation, as I left the paper in 2008 and can’t pretend that I have any deep insight into current operations (if you have better intel drop me a line) — I’d say that they’re banking on folks thinking “what the hell, it’s basically free” and choosing the digital plus Sunday offer. It’s a little tempting, isn’t it? My finger hovered over that option before remembered how much I hate taking out the recycling. 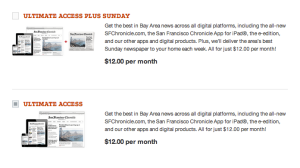 If enough people do opt to get the Sunday paper, the Chron’s business side can report to potential and current advertisers that their Sunday subscriber base has actually increased (which is not the trend these days, as you know). Advertisers like hearing things like that. The Chronicle has flirted with other ways to wall off their content, as those of you who recall their “Print Only” campaign of 2010 might be thinking. Will this effort be successful? Will people subscribe to get access? You tell us.